Inspiring Ideas with artist Jeanne Winters: Pot o' Joy! Add a fresh touch to your patio this spring -- I've got another word stencil idea for you! Garden and patio pots! I stenciled these rustic terra cotta pots with white ceramic paint. If you have a steady hand, you can easily paint a short word like "Joy" or "Hope" without a stencil. So, go ahead and embellish the pots you've got sitting around! Gift idea: Pot 0' Joy filled with a flowering plant is perfectly inspiring for any celebratory occasion - like a housewarming or job promotion! 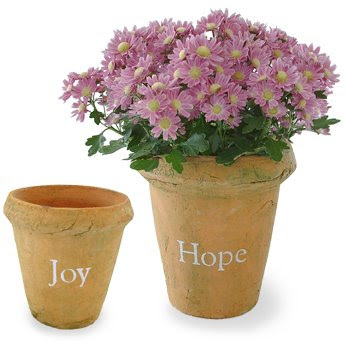 Pot o' Hope is a lovely "I'm praying for you" or sympathy gift. Hope you had a great Mother's Day! It was great to see you and catch up last week. this is exactly what i was looking for!! so glad to have stumbled upon your blog.